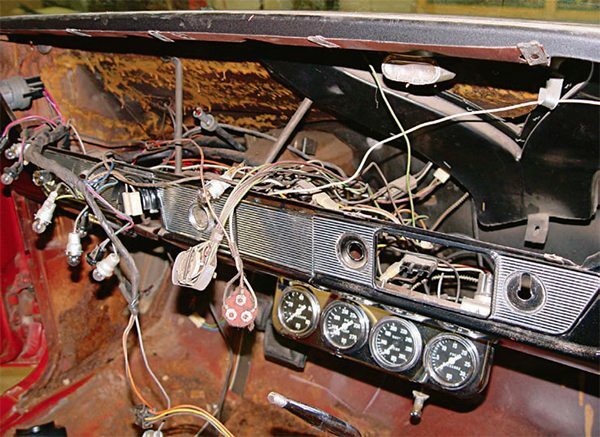 The wiring systems of the 1964– 1974 Pontiac GTOs are probably closer in complexity to a Model T Ford than anything currently in showrooms. While that may be true, wiring systems are still a point of fear and loathing among many restorers of Pontiac GTOs and other muscle car era machines. The truth is, it really isn’t that bad if you plan ahead. Armed with a decent set of tools, a little patience, and a shop manual with complete wiring diagrams, you are able to restore function to those areas of the electrical system that are no longer operational. Over the course of 40 or more years, it is likely that your GTO, like any vehicle that age, has developed some wiring problems. Perhaps the backup lamps no longer work or a power window is no longer opera­tional, and maybe the engine won’t fire. 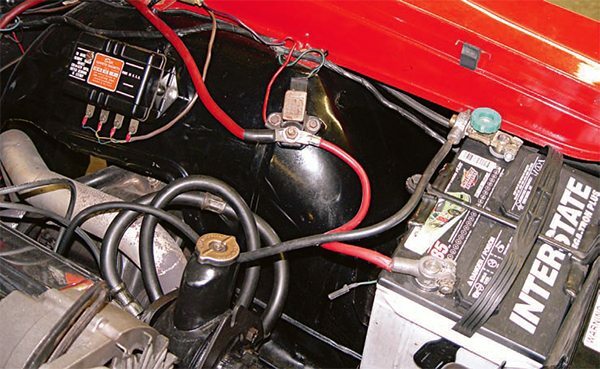 In that amount of time, wiring may deteriorate, grounds may fail, or perhaps some past owner tried to install aftermarket gauges and need­lessly started hacking away at wires, causing shorts and other problems. Whatever the case, the goal is to get everything working reliably and as originally intended. The wiring condition is probably a pretty good indicator of the condi­tion of the rest of the car. If your car was well taken care of, chances are you will have less trouble than a GTO that had been abused the majority of its life. Since I have not advocated the restoration of GTOs that are clearly good for nothing other than parts, I assume that the electrical sys­tem is generally in decent shape but in need of some help. In this chapter I show you how to repair the consequences of an electrical fire or other catastrophic failure, several trouble spots, and what you need to do for a success­ful outcome. I also show you some upgrading options that can be eas­ily added for more convenience and enjoyment. While it certainly is not the cause of all electrical problems, more often than not, a faulty ground is the main source of trouble, especially in a car of this age. Over the years, ground wires and straps become cor­roded, break, or fall off, and fray to the point that they no long conduct electricity. Ground straps are partic­ularly important on a full-frame car, as they provide a path between the body and frame where electricity can flow. With the body isolated from the frame with rubber body mounts, interior electrics really have no way to complete a circuit without them. Unibody cars do not have this level of reliance on ground straps like a conventional body-on-frame design, but even the stub-framed 1974 GTOs need them more than a modern car. A wiring diagram from your shop manual lists the number of ground­ing points and their locations. If they are missing or no longer functional, correct replacements are available. Once the grounds have been attended to, it is time to move on to the other connections in the car. A multi-tester is a very handy and use­ful item for tracking down shorts and bad connections. Once you have a complete list of electrical components that are not working, take the time to familiar­ize yourself with the wiring diagrams in the shop manual before taking any direct action. This gives you the opportunity to isolate each trouble spot and figure out where the most logical failure point is. Problems can usually be traced to a switch fail­ure, break in the wiring connection, faulty ground, or defective device, be it a bulb, motor, or radio. Use your multi-tester to see if power is actu­ally getting to the device. If it is, the device is malfunctioning. If not, look for the connection failure. Internal breaks in the wiring are often found with a multi-tester, and they can be tough to get at, often showing up in plug-in connectors in plastic or rubber housings; they are in turn part of a larger harness. Sometimes, it is a simple fix, as when a wire was pulled and stretched enough that it came out of the back side of a plug-in connector. Perhaps a plastic wire insulator cracked with age and exposed a bare wire to some bare metal and a short was caused. Keep an eye out for obvious prob­lems like that. A wiring harness is a wearable item, and after more than 40 years, it may be simply worn out. If you’re performing a complete restoration, it’s a good opportunity to install a new harness. Routing and securing the harness is much easier if the engine and interior have been removed because you have full access to do the work. If your wir¬ing harness has been substantially damaged, burned, or deteriorated beyond repair, you need to install a new one. Before you start cutting into wire insulation or taking plug-in connec­tors apart, make sure that replace­ment pieces are available. The good news is that many of these pieces are still available or are being repro­duced. Lectric Limited has become a great source not only of harnesses, but also of correct switches, ground straps, connectors, bulbs, and other items that help get your electrical system back to its original opera­tional condition. The repairs themselves do not end up looking exactly like the origi­nal wiring, but that is not a problem, most of it is not visible anyway. It is important that the repairs are per­formed correctly and are as durable as the circuit was when new, if not more durable. That means splicing the wires together and then solder­ing them with resin-core solder and covering the bare wire connection using shrink wrap. From there, it needs to be heated with a hair dryer or heat gun for a permanent, weath­erproof connection. This is no place for a quick wrap of electrical tape or other solutions that won’t last. 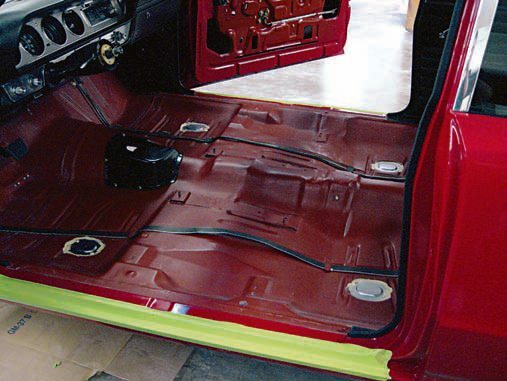 You don’t want to be pulling up carpeting or taking apart your dash again. Do it right and do it once. If the wiring harness is just too brittle, broken down, and deterio­rated to provide any more useful service, you need a replacement. Again, the aftermarket has OE-quality replacements that bring func­tion and reliability to your electrical system. Replacement harnesses are available from Painless Products and Lectric Limited; they are very nice, very robust units. There are some dif­ferences, though, not based on qual­ity but by application. Lectric Limited has two series of harnesses the Original Design Series and the Custom Update Series. 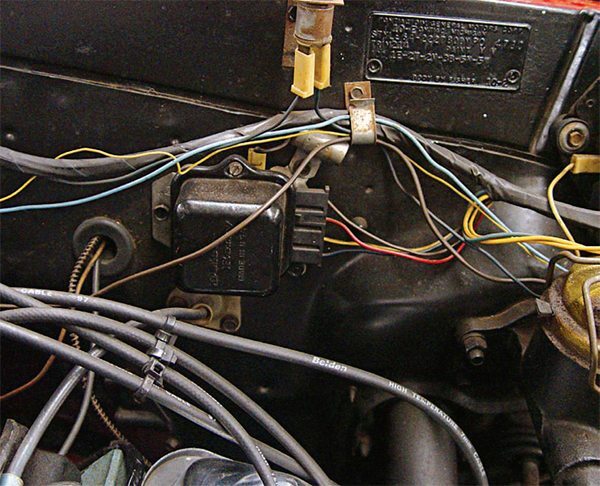 The first is an exact-reproduction wiring har­ness, manufactured using the original GM blueprints, with the correct color coding, connectors, and wrappings. You can order exact-replacement dash, engine, and front and rear lamp har­nesses. 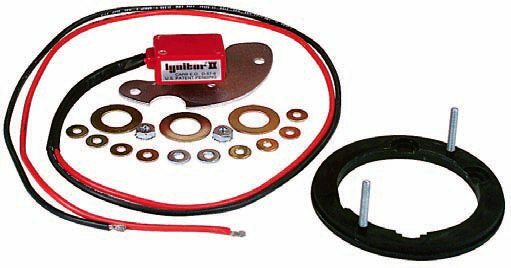 This is a great choice for con­cours and stock driver restorations, as it is a harness designed with produc­tion-style components and has a very authentic appearance. The Original Design Series also allows for some minor modifications. Lectric Limited has already designed modified versions that accommodate some commonly-requested altera­tions from stock, such as adding HEI or a newer alternator, as well as alter­nator relocation. These changes can be added to the basic wiring layout. Depending on the year and the option level, a GTO could be equipped with a 37-amp alternator. That was barely enough to charge the battery and keep the car running at the same time. Low-amp alternators were great for race cars because they didn’t use as much power to turn them. But if you are adding any power options, it makes sense to upgrade to a higher-amperage version. Installing an alternator is one of the easiest things to do on a GTO. First, remove the battery cables from the terminals, mak¬ing sure they don’t come in contact with the terminals. 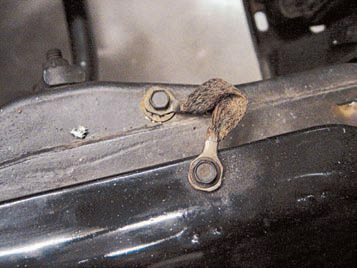 Loosen the bolts that hold the alternator to the mounting bracket. This creates slack in the belt so it can be removed. Disconnect the terminal and the ground wire attached to the back of the alternator. Remove the bolts securing the alternator. Place the new alternator in the designated position and torque the new bolts. Plug the terminal back in and attach the ground wire at the back of the alternator. Slip the belt over the pulley and push the alternator up with your hand. Use a flat-head screwdriver to push against the belt. You should be able to push it out 1/4 inch to obtain the correct tension. Torque the bolts to hold the alternator in this desired position. Reconnect battery terminals. Compatible units with up to 200 amps are available from Year One and others if you are adding EFI and an in-car entertainment system. Lower-amperage versions are also available for restorations with more modest power requirements. Although the alternator is usually blamed for charging problems, you need to check on the voltage regulator as well. Look for breaks in the circuit and use a multi-tester to confirm the resistance ratings in the shop manual. If clean¬ing the contacts still does not bring the readings to spec, replace it. If it is not operating properly, the alternator cannot properly charge the battery, prevent¬ing long-term operation. Replacements are readily available and installation is a plug-and-play procedure. The Custom Update Series is a great solution to updating the wir­ing for modified vehicles, so if you’re looking to do a full pro-touring style of build, you have that option. This harness is a little more of a do-it-yourself approach to wiring and you need to cut the wiring to the desired length and add the connectors your­self. The upside is that you can design a custom system for your exact needs and save some money by finishing it yourself. 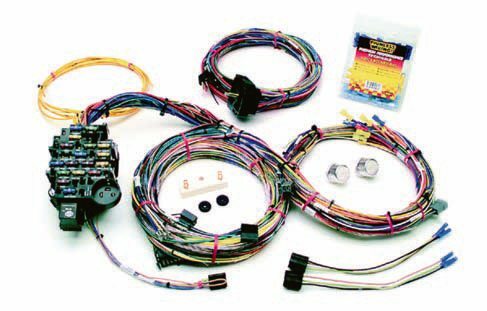 The Painless wiring kit is a uni­versal GM kit designed for 1964– 1974 intermediates, as well as F- and X-Body cars. Knowing that most of the GM mid-size offerings were more the same than they were different, especially from an electrical stand­point, Painless engineered a wiring harness that works with any of these vehicles. Although the kit uses stan­dard GM plugs and other hardware common to these vehicles, it is more of a Swiss Army knife approach it is not a perfect reproduction product but it is designed to be a function­ally identical replacement for GM’s offerings from that period. Like the Lectric Limited approach, you can mix and match different harnesses, such as interior, engine compart­ment, and front and rear lighting; and there are options within those items as well. Once the harness is installed, its deviations from the original design would take some seri­ous sleuthing to detect. Every Pontiac GTO model year has idiosyncrasies and problems; the service bulletins help solve those problems. However, there are com­mon areas that affect all Pontiacs and likely all GM cars from that era. Most are associated with age. Starters and starter solenoids can wear out over time; ballast resistors can also be the culprit. Since there are still a lot of Pontiacs from this era on the road, finding replacement starters, solenoids, and accessories is pretty easy. Even high-torque ver­sions are available if you have a hard-starting, big-inch engine with a lot of compression. Of course, if this is a concours-style restoration, you have to rebuild your original pieces, which is much more expensive. It is likely that a rebuilder in your area can han­dle the job. Ignition switches can also be problematic, and dash-mounted switches can become especially loose. It is not unusual to find mid 1960s era Pontiacs that can be started with a screwdriver. If they can get that sloppy, they can also fail to complete the circuit and leave you without a means to get your car started and running. With an older car, the charging system, like other areas of the elec­trical system, is prone to grounding issues, which can put additional strain on the alternator and voltage regula­tor. When repairing or replacing these components, be sure to replace all of the ground straps to ensure the proper function and longevity of these refur­bished components. The alternator wears out over time, and if your original, correctly date-coded unit is in need of rebuild­ing, it is something that can be done at home, or it can be commercially performed. Most kits include detailed directions and the job can be han­dled with normal hand tools. Upgrading the charging system in the quest to make your driver-quality GTO a better-performing machine is important. An upgraded stereo, high-performance ignition system, electric fans, and add-on air-conditioning system all contribute to the electrical demands made on your charging system. A stock alternator is hard-pressed to keep up. In the mid 1970s, GM replaced the old-style alternator having the external voltage regulator with a more modern, SI (systems integrated) series, single-wire alternator with the internal voltage regulator. It offered more charging power and reliability, as the regulator was more protected from the elements. 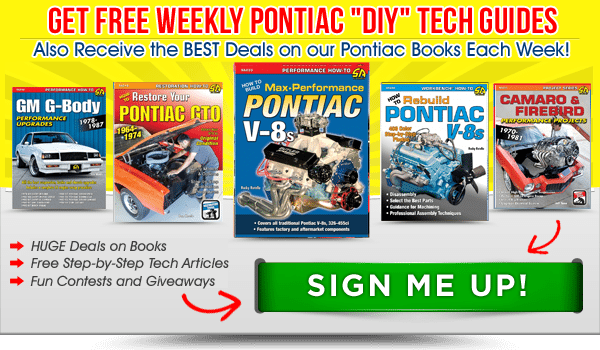 Converting your GTO to take advantage of these newer alternators is a simple proce­dure. Conversion kits are available from several sources to upgrade your system to maintain those elevated requirements. Higher-amperage SI alternators are a sensible upgrade that helps your car handle the additional strain. Units up to 200 amps are available from Year One and other sources that can be adapted to your GTO. A power level like that more than covers any upgrade in your plan. The ignition system actually gives you a lot of warning that things are amiss. With hundreds of millions of revolutions over the course of its life, the ignition has no doubt dete­riorated somewhat over time and is likely in need of some attention. Other than when it gets wet, the ignition system rarely leaves you hanging. As it wears, however, the performance of your engine gradu­ally reduces until it starts misfiring, running rough, and dropping a cyl­inder or two. 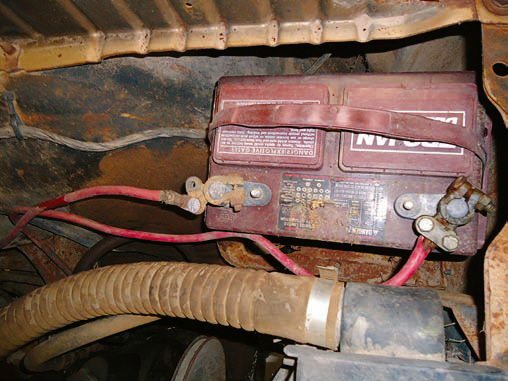 The main causes for this sort of trouble are the distributor cap, breaker points, plug wires, and plugs themselves. Replacing the distributor cap, wires, and plugs is simple. As the wires get older, their resistance increases, and less electricity makes its way to the plugs, reducing perfor­mance. Recent advancements in plug wire technology bring new levels of performance with a new generation of low-resistance wires that still look like factory items. The stereo in Les Iden’s 1966 GTO is an interesting blend of old and new. The car features a reproduction of the 1966 Pontiac A-Body AM/FM radio from Antique Auto Radio. It looks authentic on the outside but uses all modern internals. With a shallower chassis, it allows for easier installation and features mini-plug inputs so you can hardwire an iPod or satellite radio receiver directly into it. It also features 45 watts of power in each of its four channels and is an excellent alternative for those wishing for modern sound with an authentic look. Spark plugs wear over time as well and should be replaced, tak­ing the time to read the old ones for signs of engine condition and pos­sible problems. 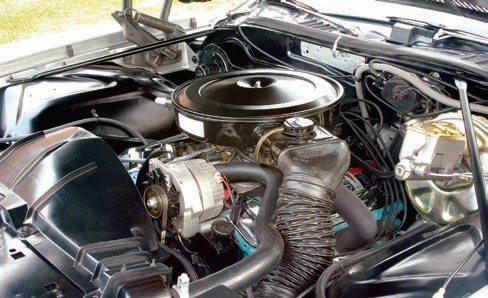 Engine builders have preferences for various brands and it never hurts to hear what their recom­mendations are for your particular engine combination. Replace the breaker points on any street-driven restoration with an elec­tronic control module and compat­ible coil, like those from Pertronix. They add to the efficiency and inten­sity of the spark, making the most of your new, low-resistance plug wires and fresh spark plugs. More spark trans­lates to a little more power, a little bet­ter fuel economy, and reduced exhaust emissions. It’s a very worthwhile addi­tion to your street-driven GTO. 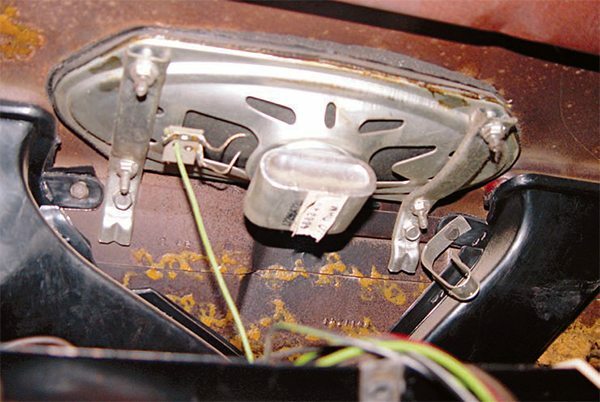 Even though the wiring system for your GTO’s lighting is fairly sim­ple, it can still cause problems and more often than not, those problems are related to the condition of the sockets for the bulbs and the grounds. Check the shop manual to determine where the lighting grounds are and how many there should be; and make the necessary repairs to bring them back to factory specs. Next, inspect the lamp sockets for corrosion and damage. Clean the ter­minals of all corrosion and make sure they are making proper contact with the bulbs at their particular connec­tion points. Headlamps have prongs that fit into their sockets, while most of the rest of the bulbs use barrel-type sockets. Order and install new sockets and bulbs as needed. The original T-3 headlamps were good for their day, but newer replacements are readily available that provide superior illumination for night driving. This is another safety-oriented upgrade that can be easily integrated into your driver restora­tion. 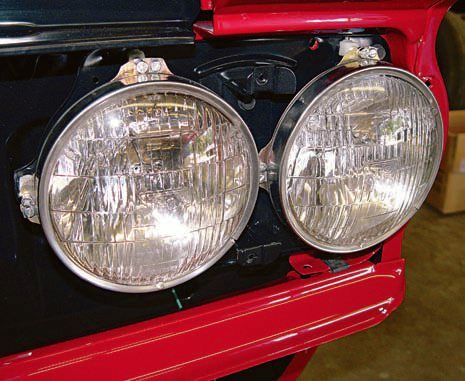 If your car still has any opera­tional T-3 headlamps, remove and safely store them, as even used ones command a hefty price from con­cours restorers. Providing a great-sounding but authentic-looking sound sys­tem has been a problem for muscle car fans either you had one that looked authentic or you had one that sounded great. For some rea­son, the two really didn’t mix, even though promises to that effect were commonplace right up to a few years ago. Unfortunately, most of them were underpowered and overpriced junk. I hate to see a late-model after­market stereo in the dash of a clas­sic muscle car because it just looks so incorrect. I am not a purist by any stretch, but the clash of design eras just comes off as clunky, uninte­grated, and anachronistic. I like old and new, just not in some grotesque Frankendash mismatch. 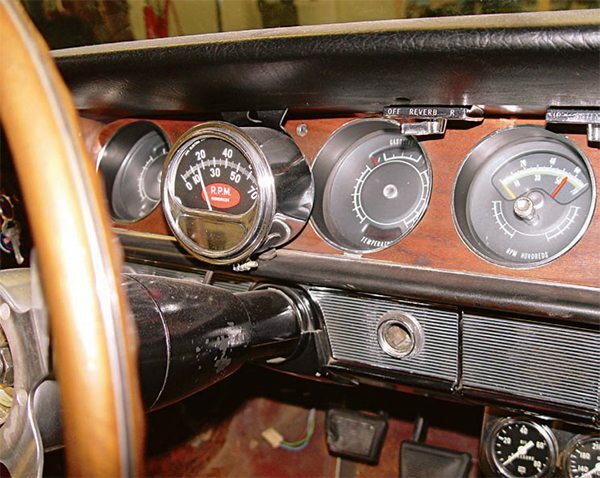 I recently photographed a car fea­ture on my friend Les Iden’s modified 1966 GTO for POCI’s Smoke Signals magazine and must admit, I was com­pletely fooled by the head unit he had in his dash. I thought it was a stock 1966 A-Body radio. When he told me he had a custom sound system, I asked if he hid it in the glovebox. He said that it was right in the stock loca­tion. I had to do a double-take. Upon closer inspection, I was amazed to find an extremely stealthy and really fantastic-sounding AM/FM stereo. Manufactured by Antique Auto Radio, this head unit fits in the stock location but is only about 3 inches deep, taking up less space than a stock radio. This unit also accepts auxiliary inputs from an iPod, mp3 player, or a satellite receiver. It’s a great-looking and great-sounding system. If you like to bring your music with you, this is a very viable option. In the case of Les’ 1966, the shallow chassis dimen­sions were especially helpful since he had added an aftermarket air-condi­tioning system and needed the room behind the radio for ducting. 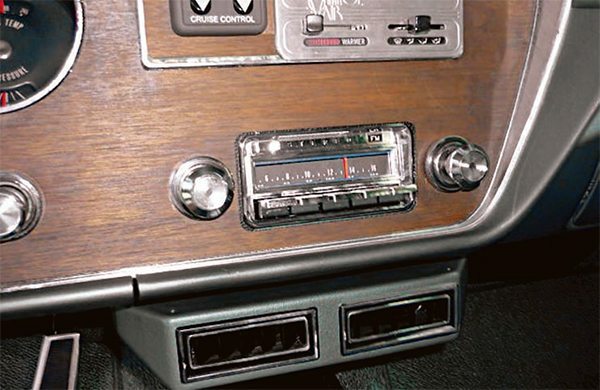 In addition to the 1966 A-Body Pontiac, Antique Auto Radio also offers a similar reciever for 1969–1972 A-Bodies, and more will undoubt­edly be released in the future. Cus­tom builds are also available that can fit in stock radio chassis for vehicles not listed.